Corner of B St. and 4th Ave.
Free Parking in the Draeger's Market parking lot and underground parking garage. There is also street parking and metro garages within walking distance. Wine/beer/spirits dinners. Visit our website viognierrestaurant.com for details. 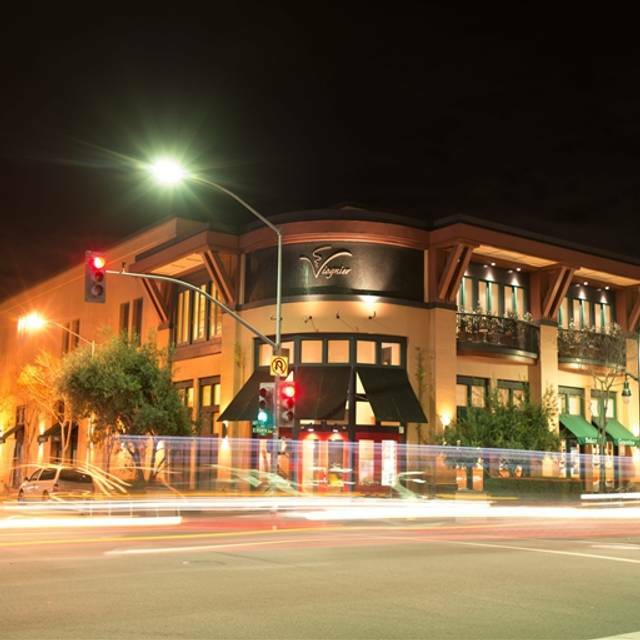 Viognier (vee-ohn-YAY ~ Refined, Elegant, Relaxed) is one of the Peninsula's premier restaurants. Named after the French grape variety that has enjoyed so much success in California, Viognier is a restaurant for all occasions. Chef RJ Subaba offers a sensational California inspired menu utilizing the abundance of fresh, local, and sustainable produce available. Like California itself, his straightforward cuisine showcases the flavors and styles from around the world and close to home. Our Sommelier has compiled a list of over 1500 wines from around the world to match with any dish or occasion. Service is knowledgeable and attentive to every need. Come relax and allow our staff pamper you and deliver an exceptional dinning experience. Expensive - but the food and service was phenomenal. The food was beautiful, both in appearance and for our palette. I went out with my uncle, sister, brother-in-law, and a friend of my uncle to celebrate his birthday. We had a great time!! Thank you so much for such a wonderful time! My group had a fantastic experience - really good food and fantastic service (professional, friendly, attentive, knowledgeable, and funny). Two of us had the premium wine pairing and thought it was really great. Will definitely go back! Everything was excellent, esp the service. Ambiance and food was good, too. I have dined at this restaurant several times and was always anxious to visit it again. I went early on a Tuesday night with three friends and although there were only two other parties in the restaurant, we were seated next to a couple and a youngster under two. The child continued to scream and we asked to be moved, certainly no fault of the restaurant. I would say that half of our order was a disappointment. My salad was over-dressed and the lettuce was soggy. My pork chop was over-cooked and I was brought another one. One of my guests had the steak which was also over-cooked, had the pork chop and the third the fish entree. My guests decided not to have the wine pairing so we ended up, following the waiter's recommendation, ordering three glasses of wine. I never saw nor was told how the the wine was. With a 15% tip the bill was $550.00. I will not return. Granted it was a slow night but the food was tired and there were several repeated items on the menu. 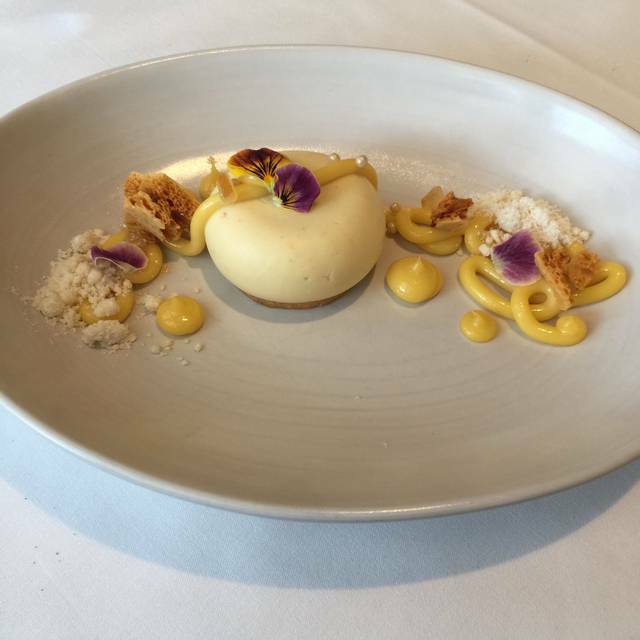 Viognier always delivers excellent service, meal and menu guidance and delivered as expected this time. Highly reliable for high quality experience overall. My wife had checked on line to see what the menu would be. However, the menu for the evening was different than the on line menu. Perhaps OpenTable might ask Viognier to keep their on line menus current. Loved everything about the place. From the set 3 course menu to the servers explaining the food when served. Never had to ask for a refill of anything...butter for the bread, they were on it, water, on it. Complimentary glass of white wine for me and the wife's anniversary. Worth every penny. Went as a couple for the New Year's Eve prix fixe 5 course menu. Not cheap, but fairly priced with outstanding food; quiet atmosphere, elegant but casual surroundings. We had a great time. The only problem was with handicapped access. We arrived for an 8 pm reservation at the main door; saw a flight of stairs and a sign stating that elevator access was through Draeger's. Draeger's was closed by then, so we had to call the restaurant. The person who answered the phone had to ask the manager what to do. Eventually the manager came down with keys to the elevator by the parking garage to let us use that to access the second floor. Leaving we reversed the process but with an employee who had been given the keys but was unfamiliar with the process for using them to get the elevator to stop on the ground floor. Viognier needs to have better signage about handicapped access and better training on that subject for their staff. Everyone was very cooperative but it was a slow, awkward process. Great food & extremely great services. Except the dinner cost is really expensive. A wonderful dining experience of the tasting menu. The portions for the two entrees and desserts were quite large for a tasting menu. The flavors and presentation were very good and the servers were attentive, but not overbearing. I thoroughly enjoyed the dinner. My only complaint is that the choices are limited, as you can only select either the five course tasting menu or a three course meal. In addition, whatever was selected had to be served for everyone - meaning that if someone wanted he tasting menu and others only wanted 3-courses someone had to compromise as they would only serve the table 5-courses or 3, but not allow for mixing and matching. Also, on the 5-course menu there were no choices, which was rather limiting. Luckily, they allowed for a substitution for the red meat, but it would have been good to have some choices. Regardless, the meal was delicious and it was a real treat to dine there. We came to celebrate a 30th birthday, I was happy they personalized and reserved a table in the corner of the room, however our waiter sat us at a different table by accident. It was the day after Christmas with only 3 other tables occupied. A very quiet setting indeed. The food was wonderful and well presented. We started with the squash soup and beet salad. It was savory and refreshing which set us up for our entrees. My partner got the gnocci and I chose the kurobota pork chop. I found the chop to be moist. I would note it is very rich! 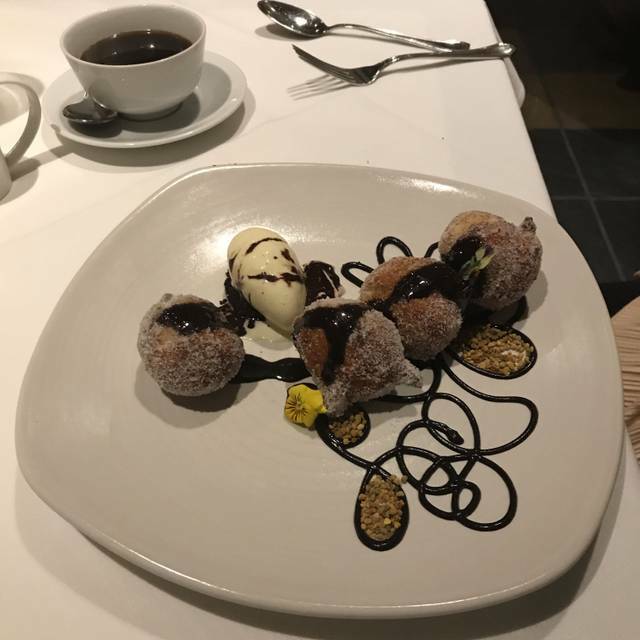 The desserts were made for picture taking. The Pear Blanc was light and the Carrot cake was tasty. We finished with tea/coffee. The restaurant gave a nice gesture with a complimentary birthday lemon and coffee ganache tarte. Delicious!!! That really closed the deal. We had a special time. Their wine selection was extensive so if you are looking to celebrate this would be a nice place. Mary was an amazing! Funny, delightful, authentic. Loved our experience, and of course, the food was delicious!!! I had not been to Viognier for about 18 months. Previously enjoyed exquisite offerings and that's what I expected last Friday night. In my party of four, two of the entrees were below par. Should have sent it back but did not want to disrupt the flow of conversation with enjoyable company. But I am disappointed. Great food, fun evening. I had no idea there was a happy hour - fun find. Food and service were very good. I had the Roasted Beet Salad and the Halibut and it was delicious. Will be back soon. Food fit for fine restaurant at a world capital city....here in San Mateo. Each dish worthy of a photograph. Comfortable user friendly setting and service. NYC or SF would cost twice as much...and fall short. Wonderful food and service. Server was extremely friendly and knowledgeable! Wonderful dining experience to celebrate the patriarch's birthday. Exceeded expectations. 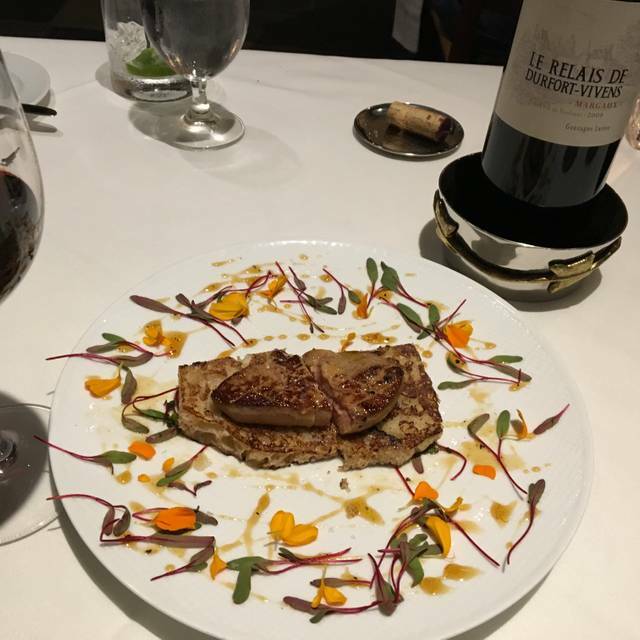 We went to Viognier to celebrate our anniversary and because I wanted to try their seared Foie Gras. To our surprise, we arrived to our table with a Happy Anniversary greeting card. Hubs was impressed. We each ordered the 3-course menu... and from the amuse bouche, palate cleanser, to each course that arrived at our table... everything was cooked to perfection and tasted absolutely delicious! At the end of our meal, our server brought us a complimentary Happy Anniversary cookie plate with champagne as a "cheers" to our celebration. Loved the experience. Thank you Viognier for making our night so memorable. Great food. And the pinot noir bottle that we ordered was fantastic. They only had a fixed menu available on the Tuesday evening we were there this week. A bit pricey for San Mateo, wouldn’t return for those prices. Too many other good options nearby. Plus, service was poor. We were a party of only 4, and none of the servers seemed to know who ordered what. Every single time they served, dishes went to the wrong person, and we ended up shuffling plates around ourselves. We laughed each time and weren’t really bothered by it, but just a note. Wouldn’t return for what the final bill cost us. Highly recommend that the restaurant rethink pricing and their menu options, as well as retrain their staff a bit. 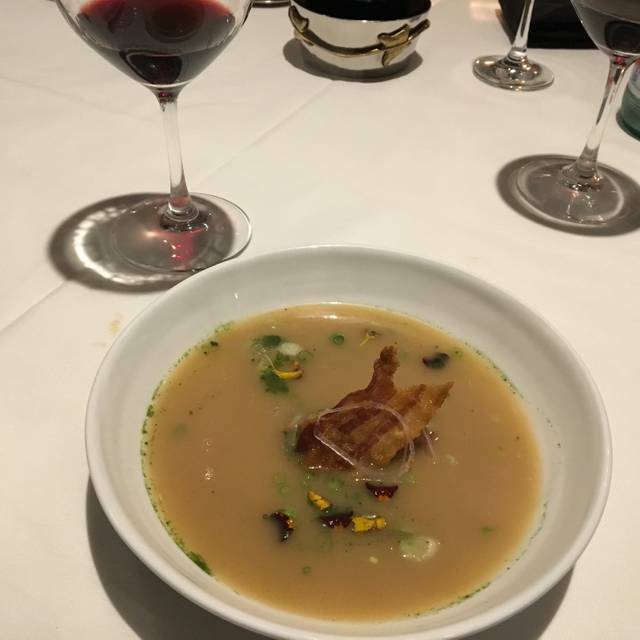 Have been to Vioginier multiple times before and had entirely different, great experiences with larger dining groups, so suspect it was an “off” night for the staff. We enjoyed a beautiful, delicious dinner here recently. Great atmosphere, quiet, sophisticated ambiance. We celebrated an anniversary at Viognier. They reserved us a nice quiet table and provided a nice complimentary champagne pour and a card saying thanks for choosing to spend the occasion with them. We both got the five course tasting menu with wine pairings at our waiter’s suggestion. The Hamachi dish was absolutely outstanding in flavors and presentation. The duck was dry though tasty. The fillet was nicely prepared. The popcorn dessert was a bit strange and left something to be desired. My biggest disappointment was the quality of the wine pairings. They ran out of the first wine and had to find a substitute that wasn’t good. One pairing truly enhanced the dish. Two were mediocre. And two were subpar. Given the hefty price tag, I had hoped for better. Overall it was a nice celebratory experience. Tasty variety of food, mediocre wine, pleasant and warm environment, and eager welcoming staff. My advice would be to know that you will be paying a premium and to strongly consider choosing your own wine. I would gladly go back on someone else’s dime, but don’t expect to see me there anytime soon if I am paying. Great spacious seating and quiet enough to talk to table partner. Food very good. Never rushed. 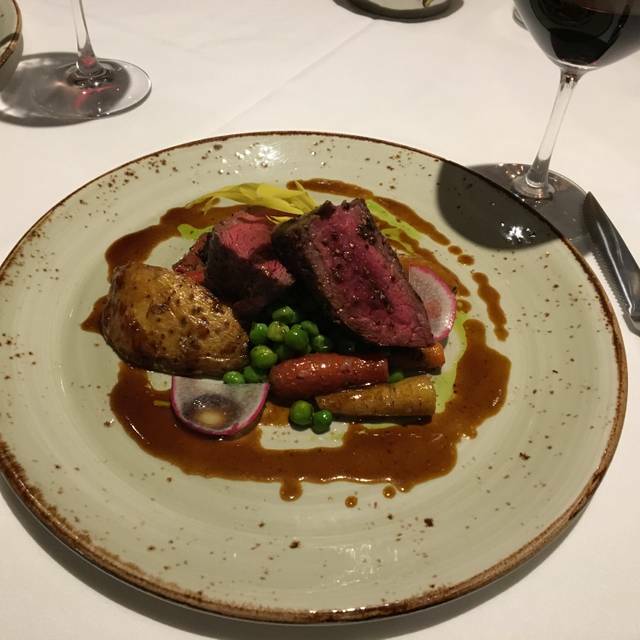 Viognier is our "go-to" place for fine dining as well as for special occasions. We went there recently to celebrate our anniversary and it could not have been better. They warmly greeted us with a "Happy Anniversary" note on our table and a complimentary glass of champagne. Our server, Cam, is wonderful: friendly and professional. We did the tasting menu with wine pairings. Drew, the sommelier, has amazing wine knowledge and did a magical job matching the wines to the selected dishes. As for the dishes: more magic. Stunning presentation and flavors. Each dish was perfection. Looking forward to our next visit. When mistakes are made their effort to fix it is excellent! There was something going on in the window section, a cooking class dinner or something large, and the wait staff was consumed by that function, and it was hard to get anyone's attention to take our order or bring me the check. Several of the salads were quite memorable (ie english pea gazpacho - fabulous! ), however, many of us who had the swordfish main course agreed the presentation was lovely but the fish itself was tough, overcooked - terrible. Our meal was very uneven. The pea gazpacho and watermelon-tomato salad were terrific and the service was warm and professional. But the porkchop was way too salty, and dry. The fish serving was tiny. The dessert was dry and stale-tasting, with almost no flavor. The venue was empty and shopworn (the menu was crumbling and left black flakes on the tablecloth and my lap). Given the whopping price tag, the food and the ambience were both definitely a disappointment. Mary and the rest of the staff were very courteous, friendly, and professional. Mary made us feel extra special. And the cuisine was delicious. The timing of the service was just right. Thank you for a delightful early evening! I booked this and surprised my wife for our anniversary, had never been and we loved it. The food was amazing, just the right portions. You can choose preset 5 course or 3 course with some great options for appetizer, main and desert. The waiter and servers were awesome, I put a note about our anniversary in OpenTable and they were all over it from the moment we walked in to the special desert treats at the end. Its above Draeger's market so we did some shopping afterwards in what is one of the most amazing markets you will ever go to so you have that as well. Highly recommend this spot. Our seventeenth anniversary was very well celebrated at Viognier. Every taste was unique and wonderful, and the staff were a joy. Our favorite restaurant! We love the food, the staff, the cocktails and wine! Worth every penny!! 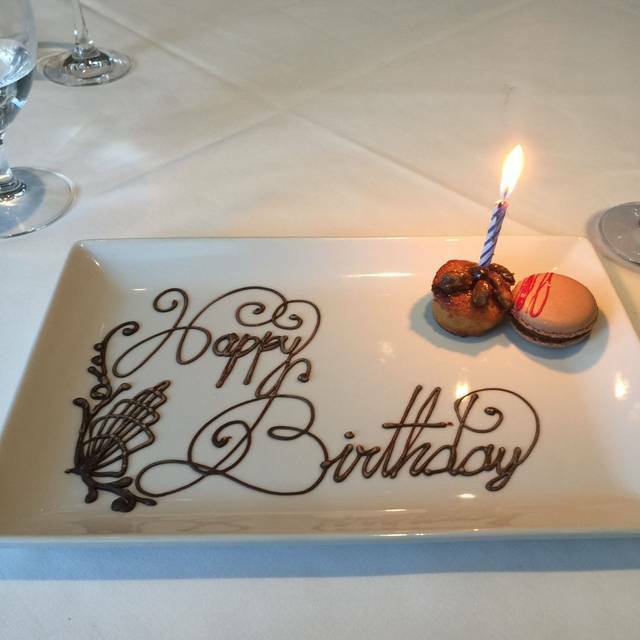 An exceptional dinner and service to celebrate a special occasion! Excellent, beautifully presented food from either a 3 course or 5 course set menu with or without wine paring. Wait staff professional, knowledgeable and unobtrusive - an elegant way to remove and/or replace dishes, silverware, etc: you never knew it was done! Thomas - our server- was the best, he made our dining experience great. He was knowledgeable and helped us pair the wine selections perfectly. The tasting menu delicious. Thank you Thomas, you were superb!